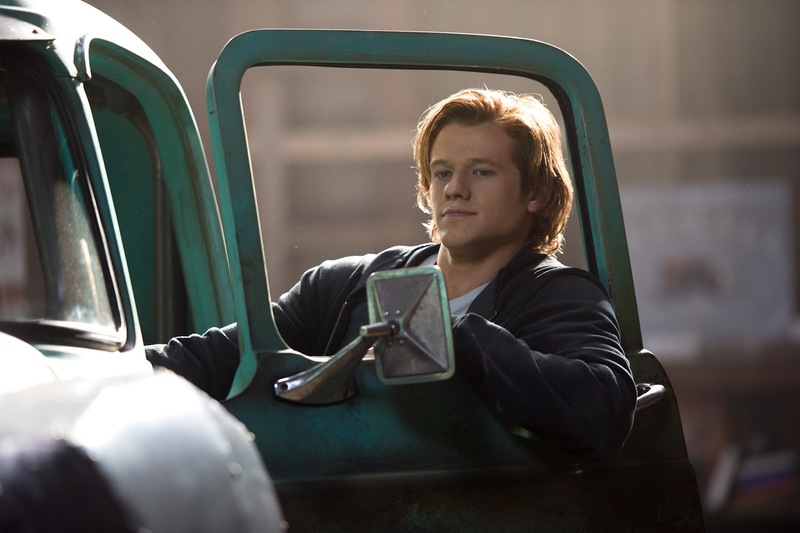 Teenage loner Tripp (Lucas Till) has always dreamed of escaping his confined life in a sleepy North Dakota town. In a town rich with oil money, Tripp and his mother Cindy (Amy Ryan) struggle to make ends meet, so Tripp takes a job at Mr. Weathers’s (Danny Glover) junkyard. Tripp’s father (Frank Whaley) left when he was young therefore he’s always entertained this idea that if he builds his own truck, he’d be free to go find his dad, so he starts to collect odds and ends to build a truck of his own, one piece at a time. Across town, a massive drilling operation is underway. Just as the Terravex Oil Company pushes into an unknown underground oil reserve, three subterranean creatures unexpectedly find their way to the surface. One of the subterranean creature found it's way to Mr. Weathers’ and made friend with Tripp, here's where the excitement starts. 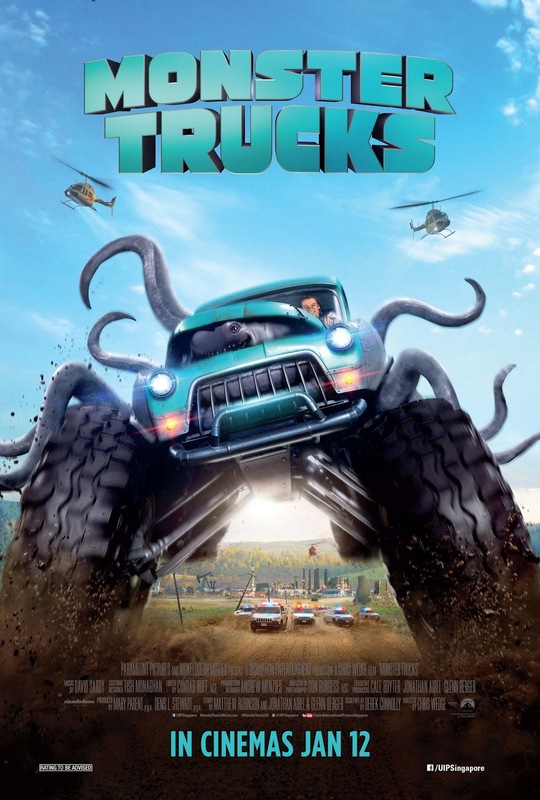 After taking up residency under the hood of Tripp’s engineless truck, the creature or Creech as Tripp named him, discovers he can power the vehicle by spinning the truck’s axels with his prehensile limbs. The truck is like a super-suit for him, allowing him to move in a powerful and surprising ways. Now, what sort of adventure will these two encounter? Well, MONSTER adventure for sure! Ok, I'm bias, the reason I gave the movie an additional 0.5 star is becoz of Lucas Hill, the cute lead guy in MacGyver (2016 TV series) and Alex Summers / Havok in X-Men movies. Yes, eye candy moment for me #auntiesimmoment. The plot is simple and predictable, how predictable? Boy meets Alien, Boy help Alien escape from evil claws, Boy help Alien go home. In the course of it, throw in some thrilling, exciting, blood pumping chase from the bad guys. On top of that, there were some scenes that did not link or add up, like how in the world Rick knows where Tripp, Meredith is going with the 3 Monster Trucks? I mean, initially he didn't believe Tripp's report about seeing a monster in the junkyard, then suddenly he is driving a humongous mining truck and stopping the Terravex guys from getting to them? The only weak link that I can see is he saw a playback of the police car dashboard camera and saw Creech's tentacles sticking out from the bottom of the truck while it jumped over a train. The flow of the movie was not as smooth too, except for Tripp and Creech, the rest of the characters were not given time to develop, its like the movie is eager to show the audience how Creech "merge" with the truck and become invincible. As for our alien character, he's cute, above the head, below that he looks like a lump of thing with tentacles. And he's cute only if he don't show his teeth. There were some scenes that Creech got mad and show a mouth full of sharp mean looking teeth, a zillion of it, gave me a shock the first time he did that. Creech lives in lakes and caves way way way below in the ground so the minute he is in the water he glows and becomes a beautiful creature, much like octopus. In short, this movie is great for the little ones to get fascinated by the alien, the car chase, the truck with BIG wheels that climbs the side of house, jump over roofs and trains. For the adults, well... just be entertained and enjoy the bonding with your kids because they will have tons of things to tell and discuss after that. I know because my 10 year old can't stop talking about it for the next couple of days. So go ahead and book your tickets to Monster Trucks which is in the cinema this weekend, a great way to unwind after the anxiety of a new school term. Disclaimer : We were invited by United International Pictures (Singapore) to the preview screening of Monster Trucks, no other compensation were received. All opinions about the movie are 100% ours after watching it. All photos and movie trailers in this post belongs to United International Pictures (Singapore).